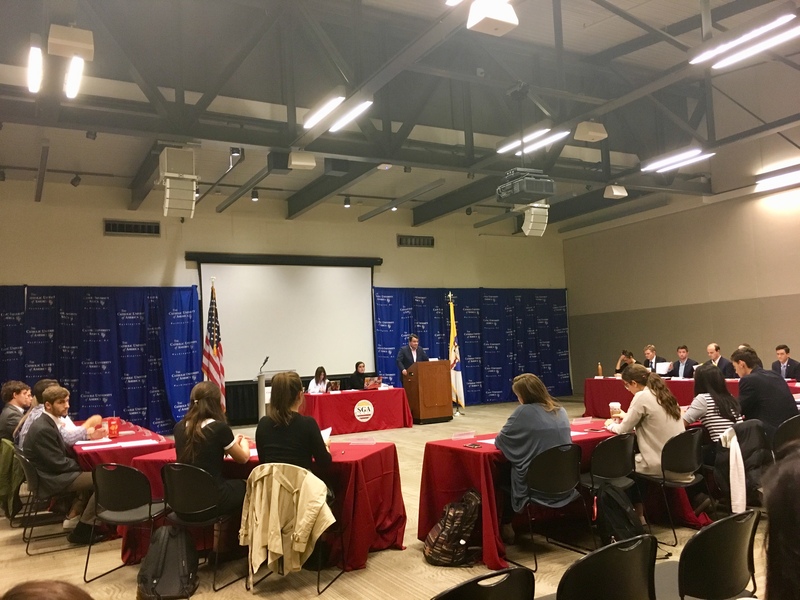 Catholic’s Student Government Association (SGA) discussed two proposals involving the Kane Fitness Center hours and student workers’ wages in its third Senate meeting of the year on Monday, November 6th in the Pryzbyla Great Room. The first proposed resolution came from Weston Kirby, John Connolly, and Sean O’Grady, SGA Senators, and it dealt with extending the operating hours of the Kane Fitness Center. The senators contended that students taking early morning courses do not have sufficient time to exercise in the morning before heading to class. The proposal calls for a two week pilot program in the spring semester in which the Kane would open at 6:30 AM, one hour earlier to see if there is adequate student interest to adjust regular operating hours. The current hours of the Kane Fitness Center are 7:30 AM-11PM Monday through Thursday, 7:30 AM-7:30 PM on Friday, 9 AM-6 PM on Saturday, and 12 PM-6 PM on Sunday. The center recently reduced its closing hour from midnight to 11 PM, citing lower numbers of students coming to work out in that 11 PM-12 AM hour. The resolution complained that this takes an hour away from students looking to exercise and an hour of wages away from student workers at the facility. Kane Fitness Center Director Wendy White has said she is willing to work with students on the issue. The Kane would utilize its swipe-in technology that students are required to sign in with upon entering the center to keep track of the attendance during this pilot period, and the center would also be responsible for the marketing and advertising to let students know of the temporary hour changes. The resolution was passed unanimously by the senators in attendance, and it will move to the undergraduate board to be examined. The SGA website also has a legislation tracker that students can follow along with the status of proposals. Additionally, the SGA discussed the possibility of increasing minimum wages on campus for non work-study students. The current rate of pay for these student workers is $8.25 per hour, with the exception of some positions that offer a higher starting wage. Senators Kirby and Elise LaFleur sponsored the resolution to raise this $8.25 rate to $9.75 per hour. The local minimum wage in D.C. is currently $12.50 per hour with the rate set to rise to $15 an hour by 2020. The District’s minimum wage law, however, provides an exception to students employed by institutions of higher education like Catholic, and states that they may be paid the minimum wage of $7.25 per hour established by the United States Government. The resolution aims to lessen the gap between the federal wage and the rising Washington D.C. wage. To support the case, Kirby pointed to the other universities in the area such as Georgetown, George Washington, and American that follow the city’s minimum wage laws and pay their student employees $12.50 an hour instead of the federal wage. Kirby acknowledged the common concern that has been brought up over the school’s budgetary issues, but says this is an example of how student employees and their jobs are not prioritized on campus. Both Kirby and LaFleur agree that a bump up in the minimum wage would not only be progress in letting students earn a fairer wage, but also an additional selling point for a university that seems to be focusing its efforts on increasing enrollment. Although concerns were raised about the school’s budget challenges and the potential for jobs to be taken away from students if this increase was implemented, the Senate voted to pass the resolution in a vote of 20 yeas and 3 nays. Sophomore nursing major Graceann Schuck attended the meeting and was excited about the minimum wage proposal. “I am a student worker here at Catholic and I think it would be really beneficial for this increase to happen for the students,” Schuck said. The resolution still faces obstacles before it can be put into effect. It must be signed by the SGA President Brianna Howard, and then it goes to the appropriate university department to be discussed further. Here, the administration will ultimately decide if and to what degree the school will implement the Senate’s suggestions.